Over the past 25 years or so, I have spent many an hour reviewing design portfolios. There has been a real mixture. Some great work badly presented and some projects that could really have benefitted from a few small changes. With so many design graduates and designers looking for jobs, I wanted to put down some of my thoughts, recommendations and common mistakes I have seen over the years about what I see as making a good design portfolio. The number of times I see a portfolio that is completely different to the kind of job the designer wants. It wastes everyone’s time. Think about what you want to do, what kind of job you want and whether your portfolio is relevant. If you really want to be an editorial designer, include some editorial work or at the very least evidence of good typography, use of photography or illustration and an understanding of how to use content – i.e., put in work that is appropriate to the job you want. If you want a job as a designer, these are the two things that you will most likely be judged on. Research, experimentation or the uses of unusual print techniques are all well and good, but the priorities for many employers are great ideas, beautifully crafted. And this applies whether it’s a website, a branding project or a book design. So, whilst research and experimentation are all vital to good design, you will need projects demonstrating good ideas and craftsmanship to get noticed. I was told this about 30 years ago and it still seems about right today. If you’ve been at college or university for three years or so, as a potential employer I would expect to see a good body of work. Two or three projects, even if they are very good, will probably not convince most people. Be it digital or print, starting and ending your portfolio with something strong and memorable is always a good bet. Try laying out all your work and think through the best order. Get the pace right. As a general rule, don’t put all the big projects together and don’t put your weaker projects at the end. Putting a simple project at the start, something with a strong idea, can often work well. If presenting your work in a standard PDF format or portfolio, one project per page or spread is usually best. And one strong image per page will usually look much better than lots of visuals crammed together. For the PDF, a simple covering page or intro, plus maybe a CV and then the work, will often suffice. And whilst you may be keen to present your poster full size, most of the time it’s not necessary. I normally find if it’s a good piece of work, then it will work just as well reduced in size. If you want to use a printed portfolio, A3 or smaller are usually fine. 6. Does it work without you? I always find it helps to ensure your portfolio is self-explanatory. Put a simple description with each project, or try just a headline and a few captions. A little information that quickly helps the viewer understand what the project is all about and what problem you had to solve. Make sure it is easy to navigate and that your phone number and contact information are easy to find. The last thing any potential employer wants to see is a portfolio that is dirty and not cared for. If you want to be a designer, show that you care about your work. Make it look beautiful. Present it in the best possible way. If you turn up with a portfolio that is messy or an iPad that has seen better days it says so much about you. The same applies to an interview. Clean the portfolio pages. Charge up your iPad. Tidy your desktop. You want to show off your work, not spend ages trying to find that file you are sure you uploaded the other day. And if sending a PDF or asking someone to view something online, make sure it looks great and works well. Think you have finished your portfolio? Read it. Carefully. And get a friend to do the same. Make sure there are no spelling mistakes. It’s a simple thing to get right. Get it wrong and it could stick in people’s minds. Remember, there are thousands of other designers out there looking for jobs. You only want a potential employer remembering good things about your portfolio, not a silly avoidable one. The same applies to other details; how you name your files, the typefaces used or even the design of your portfolio case. Think about all the details – they make a difference. However you work, whatever your discipline, you will probably need to be able to present your work both on screen and in print. Online and PDF portfolios are commonplace, but think about how they might work if you go for an interview. What if the Wi-Fi isn’t working? Or you forget the adaptor? Ensure you always have a back-up plan. Make sure the online experience is as good as the print version. If the digital version doesn’t work, a few beautifully printed pieces can be just as powerful. If you get the opportunity to present your portfolio face-to-face, practice presenting. If you only have 10 minutes to show your work, make sure you know what you are going to say and keep it simple. 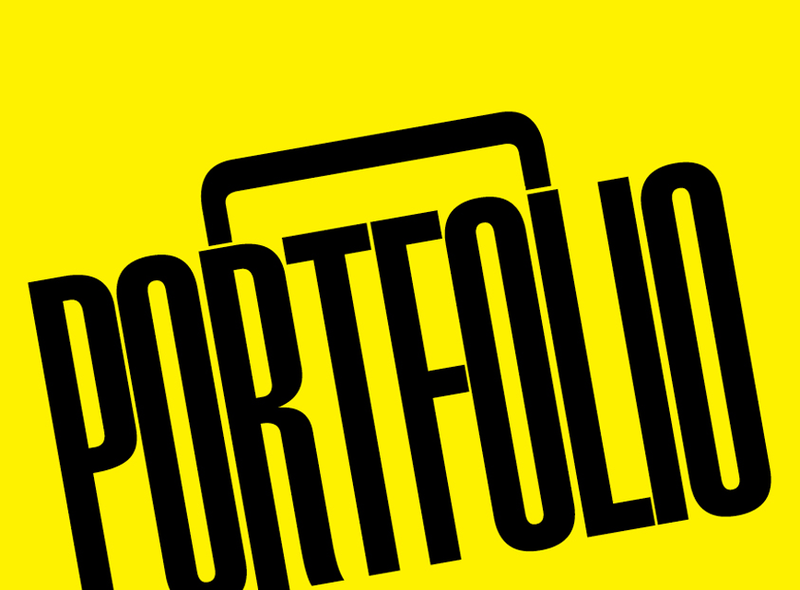 Make sure the person you are presenting your portfolio to, can see the work clearly – turn the portfolio to face them. If the interviewer has already seen your work online, think about what else you might share when meeting face-to-face. And remember to have something ready to leave behind with how you can be contacted. Written by Bob Mytton. Bob is Partner and Creative Director of Mytton Williams, an award-winning independent brand and design studio, creating, developing and managing brand communications for national and international clients. Prior to setting up Mytton Williams, Bob started his career at Pentagram and worked in London for eight years before setting up in Bath in 1996.